I've just read that a German car specialist in Singapore has managed to do this in an A4 B9. Anyone seen this offered in the UK yet? Jcbmally, Thundercliffe81 and A12RNX like this. That’s awesome, I’d love that. Imagine you just need the receivers in the wheels and then maybe some recoding using OBDeleven? Jcbmally and Thundercliffe81 like this. Jcbmally, Thundercliffe81, Keef and 2 others like this. I don’t know why this isnt standard on a Audi to be honest. My Dads Vauxhall insignia has it lol. Also very interested if anyone figures it out. I'm betting it will be eye wateringly expensive!! A12RNX, Jcbmally, Thundercliffe81 and 1 other person like this. Ah ok thanks Sandra - I thought he just did coding. This needs hardware as well. RS4 has this so cant be too bad to retro fit/code...can it??? For me, this would be a nice to have but just another thing for me to become obsessed over and check constantly.,. Then I’d have to keep checking pressures manually to reassure myself the system is working & accurate lol. pierreluigi88 and Thundercliffe81 like this. He does retrofit as well. pierreluigi88 and Jcbmally like this. pierreluigi88, Jcbmally, Keef and 1 other person like this. Is that the RS4 display coded on an A/S4?! Ha ha no sorry it's a RS4. DJAlix might be able to sort something though. Sandra and Daggerit like this. Unfortunately I can’t see any of that on my mobile phone, hence the question. Gulp. That's not what I wanted to hear haha. surely if we have a sensor that detects a drop in pressure, the pressure must be monitored ? ?otherwise why do we reset it when we check pressures? I think our cars have indirect TPMS which uses the ABS system to detect a difference in wheel speeds. It's really only useful if you've got a flat tyre. cuke2u, Daggerit and zippster like this. my wife mini clubman has pressures shown whilst driving too..
On the car (B9 avant) I have ordered it says "direct". Perhaps they've changed it for MY18? Previous: B9 2018 Audi A4 Avant Black Edition. 2.0 TFSI 190 PS S Tronic. Metallic Glacier White. Matrix LED Headlights. Previous: B7 2005 Audi A4 2.0 SE TDI 140 PS. Metallic Silver. Poverty Spec. My spec says the same too. Collect the car this coming Wednesday so will find out then. Awesome - so you guys may have direct TPMS (along with all the remote locking stuff from the app that the earlier cars don't) - very jealous! 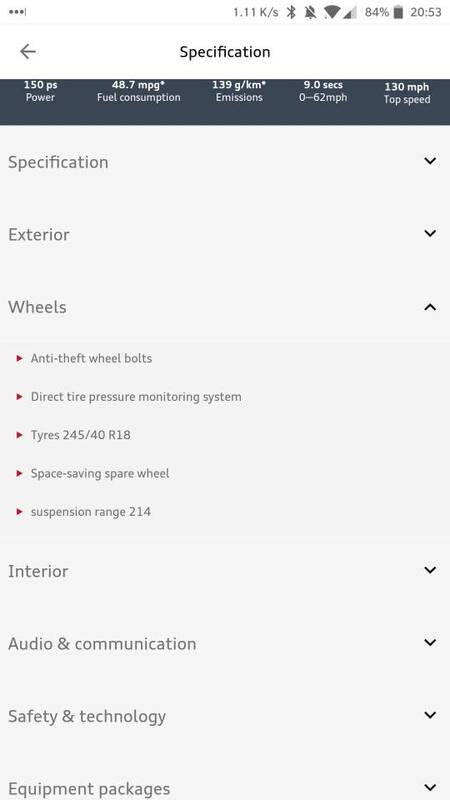 The optional one on the RS4 is called ‘tyre pressure monitoring display’ which I think is still different than the direct tyre pressure monitoring which I’d assume is ‘directly’ from the ABS sensors? Reply from HazzyDayz. What a good company - I've used them before for a SatNav install in my previous car and thought they were excellent. I've ordered a kit for R&D purposes in my own vehicle and will add this to our website and drop you an email once available. This will most likely be early July. The RS4 has TPMS, doesn't use ABS sensors. 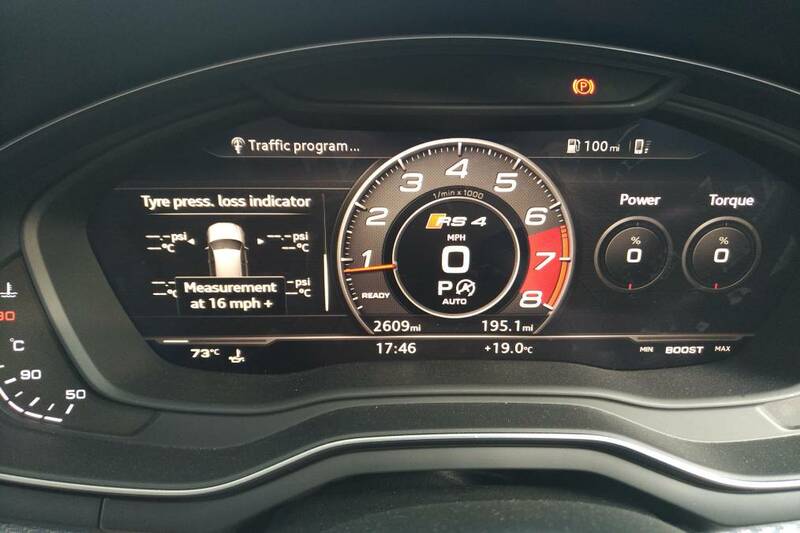 The "tyre pressure monitoring display" allows you to view the pressures on the screen, rather than it just bonging when a tyre looses pressure. RS4 has "trick" dust caps which presumably are measuring the pressure? Interesting, mine is MY18, built in Jan, picked up last Sat in Jan, and mine does (see screenshot upthread). Has anyone got anymore info on this? I can get some genuine sensors all 4 from someone at half the retail so was wondering if the s4 b9 2017 would already have the stuff to receive the signal? You need to have a receiver unit in the car to get proper pressure measurement (direct) from any direct sensors in the wheels .. This receiver costs about $4 for an OEM to buy , and is basically a 433MHz receiver unit (TPMS units in the wheel transmit @ 433MHz ) and CAN interface. TPMS unit on the wheel measures pressure directly and also temp.. transmits it about once a minute to the receiver unit (To preserve battery life). I was pretty pixxed off that on a £54K MY18 S4 it only has indirect TMPS... pretty poor from AUDI. My last 3 Bmw all had direct TPMS. It is a joke, Audi should do what they do with everything else make it a option you can add. Seems to be a bit of confusion on this thread and some posts have answered bits of the question but not fully so maybe I can add a bit of info to clarify. Firstly (currently) the RS4 and RS5 do not have tyre pressure monitoring as standard. This is a cost option. The RS models have the same basic system that all models in the range have as standard. European law dictates that all new cars must have a function to determine pressure loss in the tyres. The cheapest way to implement this (and what we all get as standard) is the ABS system detecting a change in the rolling radius of the wheel/tyre. This is why you need to reset it. You’re basically telling the system that the current rolling radius is the starting point and it will tell you if this significantly reduces. The more expensive way of doing this is with special valves (one in each wheel) which measure the pressure and communicate this wirelessly to a receiver module. This then shows you the actual pressure of each tyre. Many manufacturers offer this as standard on their cars now but Audi as usual are gouging us by charging for it. In order to retrofit it, you’d need to have compatible valves fitted to each wheel, ensure that the receiver module is already in the car, or can be fitted and then have it coded to work. The valves themselves are generally around £100-£200 a set and the. You’ve got the labour charges of getting a tyre shop to fit them. Then you have the receiver module (if it’s not already a standard part of the cars hardware - most likely it isn’t) and the labour involved in installing it. Coding will probably be fairly simple with VCDS or similar. Personally, I’ve had it on my last two cars. It’s handy but I don’t miss it. psychopomp1 and A12RNX like this. Thanks for the explanation but is it easier for those of us who have 'direct tire pressure monitoring system' installed on our My18 cars? Other than taking Audi's word for it, is there any way to independently check that we have direct TPMS rather than the indirect TPMS installed? If your valve stems are silver you have direct (active) TPMS, if black then you have indirect (passive) TPMS. If you had direct TPMS then you would have a menu in the MMI which would allow you to see your pressures and temps. If you don’t have this then you have indirect TPMS, which when selected via the MMI will only give you the option to “store current tire pressures”.